The 3.7 million Central Provident Fund (CPF) members who are in the process of receiving their yearly statement will notice a makeover. 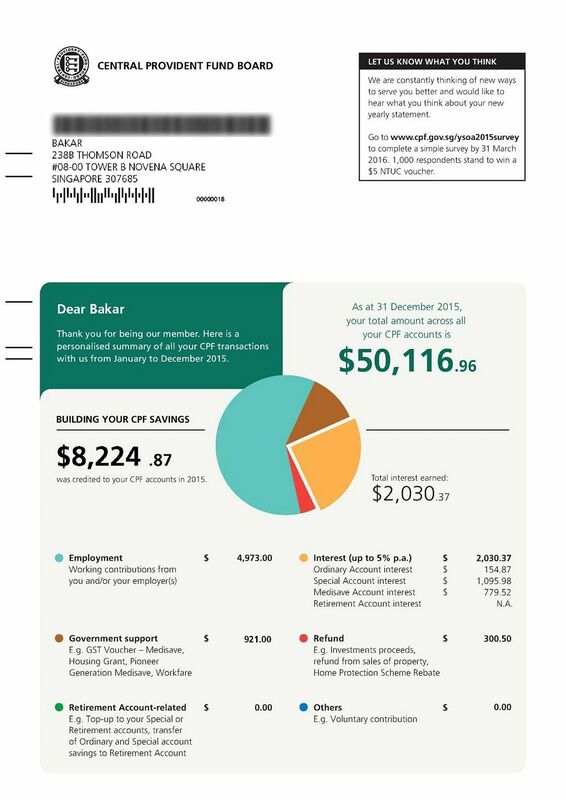 Instead of row after row of numbers, the first page shows a colourful graphic summarising their total savings and the interest they earned in the past year. It also explains the various sources of input into the accounts, such as contributions from work, refunds and government support. The next page shows an infographic breakdown of the amounts debited from members' accounts in the past year, categorised into various uses such as housing, healthcare and investment. The CPF Board said yesterday it made the changes after a series of focus group discussions with members last year. "We hope the illustrated summary can help members better understand the various contributions to and uses of their CPF balances, and will enable them to make informed financial decisions," said Ms Ong Woei Jiin, the board's director of member accounts services. The board is also sourcing feedback via an online survey which allows users to highlight areas in the statement they find confusing. Previously, the annual statement listed every transaction for the year. But it was up to readers to tally the amounts in the different categories. Members will still receive the transaction list, in an updated font, at the back of the summary. "I thought it was an advertisement at first because it's so colourful," quipped 60-year-old quantity surveyor Leu Fook Teong. He gave the new format a thumbs up: "Last time it was just lines of numbers like an office report. Now it shows my total investment returns and medical spending, and I don't have to go add it up myself." For those below the age of 55, a portion at the end of the summary page indicates how much more interest they stand to earn by the time they are 65 years old if they transfer $1,000 from their Ordinary Account to the Special Account. The Ordinary Account has an annual interest rate of at least 2.5 per cent, while that of the Special Account is at least 4 per cent. The more than three in 10 CPF members aged 55 and up will see information about monthly payouts under either the CPF Life scheme or the Retirement Sum scheme. West Coast GRC MP Foo Mee Har said the new summary page allows people to see at a glance how much interest they are earning on their savings. The new format could also help them see if the amount put aside for retirement is too little. She said: "The areas listed are a good reminder to help Singaporeans get to know their CPF well... and fully optimise their CPF savings."